Find Missing Persons in Pakistan. Private investigators Beyond Sherlockean dramas: What it’s like being a private investigator in the real world private investigators on absurd requests, cases and the challenges they face. Private Detective Pakistan doesn’t take any work which is against the National Interest of Pakistan. 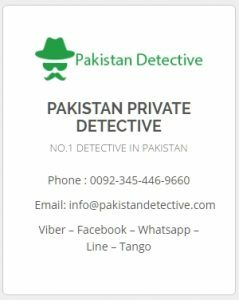 Private Detective Pakistan is made by the people and for people for people to share information through a confidential platform for the betterment and crime free society. 100% guaranteed that we can give to you. We will never disclose your attention and your case or anything belong to you at any cost. All right reserved Pakistan Detective 2017.